You can build out all the Charlie Chairman and David the Developer personas that you want, but how well do you really know the people who click on your PPC ads? 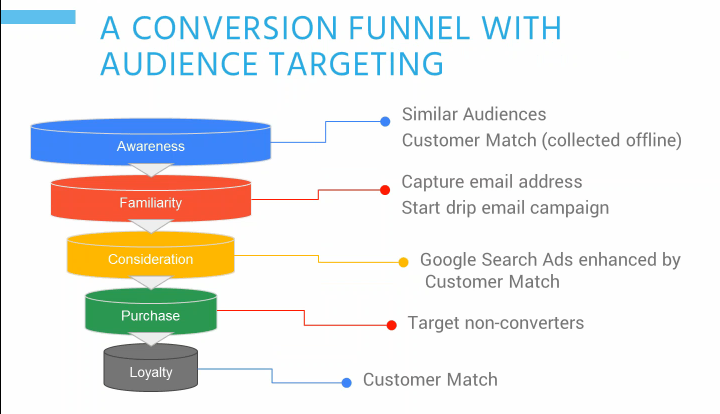 Former AdWords Evangelist, Frederick Vallaeys, spoke with Acquisio users in a recent webinar about the significance of Google’s new Customer Match feature, within the Audience Targeting options for search ads. Focusing on how Customer Match can help you keep your clients close, segment audiences, reduce churn, and update your online conversion funnel, with examples and insight from Frederick Vallaeys, we will explore the value Customer Match brings to your PPC campaigns. The possibilities of using email lists to target specific audiences is jump-for-joy exciting in the world of PPC advertising, where it has always been a pull model (leads come to you) rather than a push model (you seek out leads). On top of the Customer Match capabilities that allow you to remarket to customers or leads with your search ads, you can keep better tabs on your customers, so to speak. In the webinar, Frederick Vallaeys explained this concept with the example of a guy whose car broke down at the side of the road. In the past, the unlucky guy would have searched for a tow truck, relevant ads for local tow trucks would appear, and that would be all. Today, with Customer Match, interested businesses and dealers can get into the action too, and they don’t have to be local tow truck owners. Let’s say you’re a Volkswagen dealer. 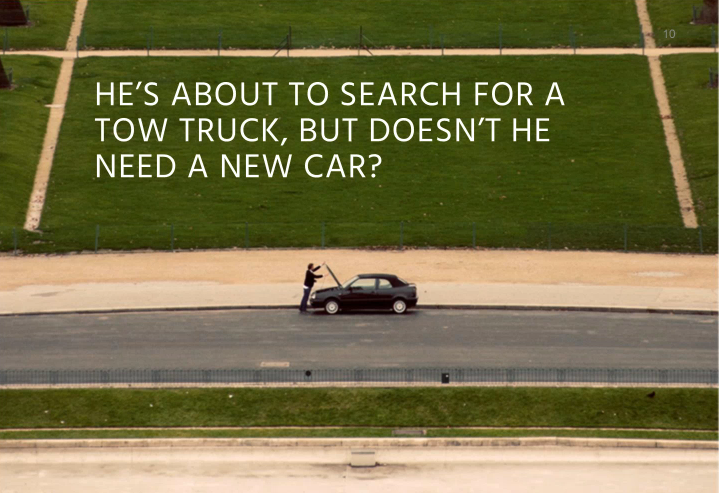 Wouldn’t you want to know if someone you sold a car to five years ago needs a tow truck? 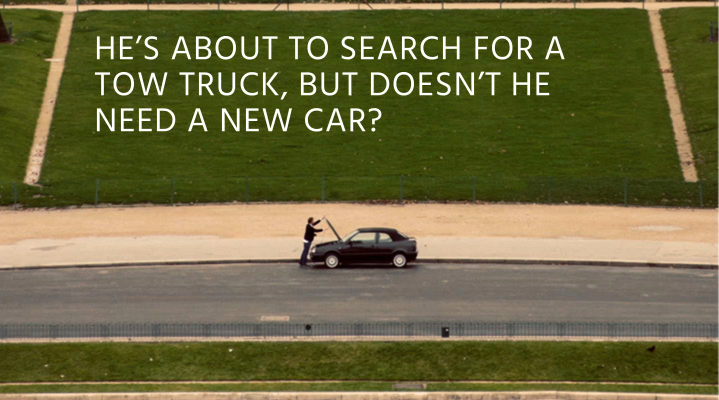 That person is likely in the market for a new car. And with the existing sales relationship established, there’s a good chance he would buy another car from you. As a dealer, you wouldn’t have targeted the keyword “tow truck” because it’s not relevant, but now with Customer Match options, Google layers this on top of retargeting for AdWords and it makes sense for your company to reach out to specific customers with a targeted ad. When someone from your CRM list searches for a related keyword, like tow truck, because you know something about that user, that could be a good opportunity to get your message in front of them. Setting up customer match is fairly straightforward, and only takes about a minute to go through the steps in AdWords (seriously, watch the 1:26 second video below to see how easy it is). If you’re the Volkswagen dealer trying to get your ads in front of the guy who bought a car from you and is likely in the market for another, you would want to upload a segmented email list, maybe organized by model, so that when those people search for the keywords you are bidding for, you can showcase an ad with their exact car model to grab their attention. Keeping the car dealership example going, if you know whether a person bought a sport car or a minivan from you, that has different implications on what terms you will bid on and what ads to show these very different audiences. If someone searches for, “buy a used car,” when they have been segmented as a minivan customer, because you’ve segmented them clearly, you can show them a minivan ad and have more of a chance of converting that customer. After all, 70% of online consumers agree that the quality, timing, and relevance of a brand’s message influences their perception of a brand, according to a study by Google and Ipsos in 2015. Frederick Vallaeys mentioned another important example in the webinar, that could potentially help you improve client retention. Most companies are used to targeting competing brands as keywords, because it gives them the opportunity to attract people looking for products or services similar to the ones their company offers. With Customer Match, if you segment your email list to current clients and target your competition’s branded keywords, you can learn whether a current user is searching for your competitors. If they are, you can share a targeted ad that tells this customer about key business features you offer, in case the client is unaware of the full capabilities of your company, or promotions to help convince your client of the value of your business. In this example, and the dealership example, your PPC strategy is reminiscent of traditional marketing, where it was less about keywords and number crunching and more about audiences and creating a message that with resonate with them. Potentially most important of all, adding Audience Targeting features like Customer Match changes the conversion funnel for your business. You could use display ads to get your message in front of people. Once they’ve seen the display ad, they might search for your company and convert, at which point you can target them more specifically for loyalty purposes. 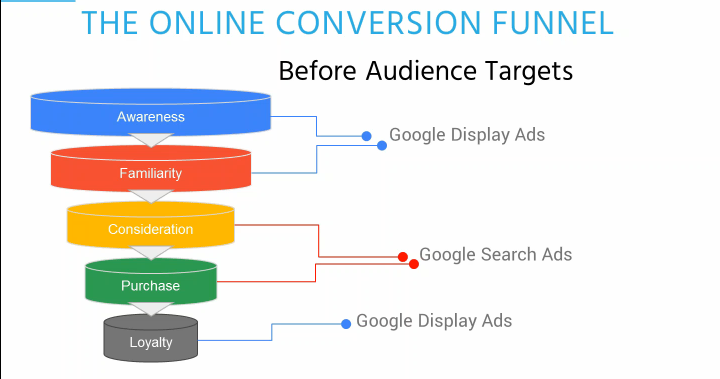 With Audience Targeting capabilities, the conversion funnel changes. At the awareness level you can take your email list, including the contact information of people you connected with offline at tradeshows or in stores, and create a Similar Audiences segment, where you can target people who are like the leads from your email marketing list. This builds your audience and grows awareness. At the next stage, you can capture emails and do drip email campaigns to push the user along. In the consideration phase, with Customer Match, you’ll have more information about the people you are targeting, and you can start remarketing and bidding higher for people certain segments or people who visited certain pages. You can also filter out people who have already bought or converted. Finally, in the loyalty phase, like the guy with the broken down car, it’s about how to keep the relationship going. With Customer Match you can bid higher when you think a person will be in market again (like when your client is looking for a tow truck) and this will help you convert those leads more effectively. Ultimately, with Customer Match, you have more options to target leads and turn them into customers. In a nutshell, Customer Match enables you to keep closer tabs on your clients online actions, segment audiences to target more effectively, reduce churn, and make improvements to your online conversion funnel, all of which are worth exploring in the coming year. If you’re interested in hearing more about Customer Match or learning about other important digital marketing shifts our expert panel of PPC professionals discussed, check out the full webinar with Frederick Vallaeys, Brad Geddes and Marc Poirier.